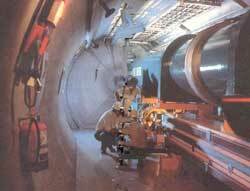 IN OCTOBER 1993, the US House of Representatives voted to terminate funding for the $11-billion Superconducting Super Collider (SSC), the most expensive basic research project in history. However, the chances are that only a few of the representatives realised the consequences of their decision: it could scuttle the fate of particle physics, the science that explores the fundamental structure of matter. Predictably, the vote evoked strong responses from the particle physics community. "We're dead," exclaimed Ed Farhi of the Massachusetts Institute of Technology (mit). Said mit Nobel laureate Jerome Friedman, also a member of the SSC 's scientific community, "It's a sad day for American science. The SSC was 20 per cent complete. It had been meeting its goals. The scientific need for it was greater than ever. To terminate it at this point is a tragedy." The impact of the bombshell decision was as profound on physicists on the rest of the country. All other US accelerator projects, they lamented, were peripheral, complementary or preliminary to the cherished SSC. The SSC was certainly no ordinary project. Using the latest superconducting magnet technology, it would accelerate protons in its 87-km elliptical ring to fantastic energies speeds at which physicists hoped to find the answers to some crucial questions in particle physics. According to John Ellis, head of the theory division at the European Organisation for Nuclear Research (cern) near Geneva, "Theory has posed 3 complex but well-defined questions: how can the forces of nature be unified? Why are there so many fundamental particles such as quarks, electrons and neutrinos? Where does their mass come from?" Particle physics had been stagnant since the early '80s -- physicists were stuck with the same picture of fundamental particles and forces, the so-called Standard Model -- until the discovery of the W and Z particles at the CERN laboratory in 1983. Although accelerators at the Fermi National Accelerator Laboratory (Fermilab) in Illinois, usa, Stanford and CERN were contributing towards a better and more refined understanding of the Standard Model, there was no hope of them providing answers to the many open and fundamental questions raised by the model. The restricted energies of these accelerators were a major limitation in the exploration of physics beyond the Standard Model and the SSC was seen as the powerhouse that would break this stagnation. The most important contribution of the SSC would have been in the search for the Higgs boson (named after the British theorist P W Higgs), a key entity of the Standard Model that has not yet shown up in any of the accelerators. The SSC 's high-energy collision would have recreated conditions that prevailed in the universe's infancy, moments after the Big Bang, when today's diverse particles and forces were "unified". Physicists hoped to answer why particles have mass, which required the detection of the theoretical Higgs boson, and whether still more unknown particles exist. God's particle Although the Standard Model demands the existence of the Higgs particle, it does not tell US anything about its mass or interactions. It would have been a major breakthrough if physicists detected and studied the properties of the Higgs particle. So important is the boson that Nobel Laureate Leon Lederman calls it "God's particle" in a book of the same name. The search for an unified theory poses is one of physics' foremost problems. The unification of the 4 fundamental forces -- gravity, electromagnetism, the weak nuclear force and the strong nuclear force -- has attracted many brilliant scientists, from Michael Faraday and James Clerk Maxwell to Albert Einstein, but the real fillip to the programme came in the '60s with the success of the electroweak theory, which unified the electromagnetic and weak forces (see box). It was only after this that physicists became bold enough to come up with theories that went beyond the Standard Model and sought to unify the strong nuclear force with the electroweak. These theories, known as the Grand Unified Theories (guts), although elegant in their conception and definite in their predictions, don't have a shred of experimental evidence to support them. Proving the predictions would require energies far beyond the reach of existing accelerators (see box on energy scales), but there are some that can be tested. For instance, one prediction -- about proton decay -- still remains unverified. Protons are generally considered stable. They are made up of quarks, which, as predicted by Sheldon Glashow, can decay into electrons and neutrinos, and so protons, too, must disintegrate. Presently, about half-a-dozen labs, including a project by the Tata Institute of Fundamental Research and the Indian Institute of Astrophysics at the Kolar Gold Fields in Karnataka, are looking out for a flash of light that will confirm proton decay. Nevertheless, the beauty and elegance of the theoretical construct has encouraged theorists to go beyond guts and incorporate gravity into the unification programme. The most popular attempt to unify gravity with the other 3 forces has been through superstrings. These are extremely small entities -- in terms of size, what protons are to the solar system, superstrings are to protons. Unlike point particles, such as electrons, neutrons and protons that are localised in space and can be described mathematically as points, superstrings are extended objects whose excitations are supposed to give rise to the known elementary particles. Although there has been a lot of theoretical work on superstrings, the goal of producing a self-consistent, elegant theory that would claim to be a Theory of Everything (toe) is still a utopian goal. Moreover, the realisation that the energies required to test the theory could never be attained in accelerators has spawned an interesting methodological debate. While many "superstringers" think the mathematical beauty of the theory is reason enough to pursue the theory, many other particle physicists feel the theoretical work should focus on theories that can be tested in laboratories. Again, to test theories incorporating gravity, tremendously high energies, presently unattainable, are needed. The particle physics community has already taken steps to cope with the death of the SSC. Plans for a big collider at CERN have been approved. This machine, the Large Hadron Collider ( LHC ), though not as powerful as the SSC, will produce energies that are several times higher than those at Fermilab, where the highest energy is now available. Apart from Higgs particle, the LHC will look for signals of supersymmetry, an approach that requires the doubling of all particles of nature with their supersymmetric partners or "sparticles". So far, experimentalists have looked in vain for these particles. Along with the $3-billion LHC , which should be operational in 2003, there are plans at Stanford, California, for a large, linear electron-positron machine and a B-factory, a machine specifically designed to study particles called B mesons (B mesons are extremely short-lived particles that physicists believe hold the key to the imbalance between matter and antimatter in the universe). Although the energies at which guts- or superstring-inspired theories can be tested are beyond the reach of any conceivable accelerator, there exists a natural laboratory for them: the early universe. The Big Bang model demands the existence of a very hot and dense phase in the early evolution of the universe. Studying this phase is providing important inputs for particle physics. In the past decade, cosmology and particle physics have interacted in a way beneficial to both fields. In fact, a whole new branch of non-accelerator particle physics has now emerged. Studying the properties of neutrinos (particles that are considered to be massless and whose interaction with other matter is extremely weak) is one of the major areas of interest. Detection of wimps (weakly interacting massive particles), which are the favoured candidates for "dark matter" (invisible matter in the universe that could account for 90 per cent of the total density of the universe, which many physicists believe contain the highly-elusive neutrinos) is another growing field. The demise of the SSC has not left everyone unhappy. For some time now, there has been a fierce Big Science vs Small Science debate between physicists. The proponents of Big Science argue that to push the frontiers of knowledge, it is imperative that big projects like SSC and Spacelab (an ambitious NASA project to send probes into outer space) continue to be given public support. After all, they argue, government support of Big Science has yielded rich dividends, ranging from the space shuttle to the present understanding of particle physics. Whatever the future of physics, one thing is fairly certain: the golden age of unlimited US government support to particle physics is over. Experts now foresee giant projects like the SSC turning into international collaborations. There is already talk of the US becoming an active partner of CERN and a multinational collaboration for the planned accelerators in the us. The LHC is the only hope for high-energy physicists, assuming that Europe's recession-prone governments don't turn their backs on their own mega-machine. The total cost is estimated to be around $1.8 billion, excluding labour costs. The main reason the LHC will cost only a fraction of the SSC is because it will be built inside the 27-km circular tunnel that houses cern's existing collider. Llewellyn Smith, director-general of cern, hopes the US and other countries involved in the SSC will share construction and operating costs. India has already shown its willingness to share costs. In March this year, officials of the department of atomic energy forwarded their $50-million proposal to contribute humanpower and hardware such as magnets and detectors. The termination of the SSC does not mean the end of particle physics. Innovative methods like the recent development of the plasma beat-wave acceleration technique, which promises very high energies in the lab, can be fine-tuned further. The plasma beat-wave technique was discovered by a team of scientists, including India-born Chandrashekhar Joshi, of the University of California at Los Angeles. Based on the laser beat-wave theory proposed a decade ago, it overcomes a limitation in conventional particle acceleration and enables higher acceleration rates, paving the way for small and compact high-energy accelerators. The acceleration achieved by the research team was the highest so far and 30 times higher than previously achieved. Even though this innovative, bench-top accelerator cannot substitute for the SSC or LHC , the ingenuity of humankind offers hope. It could be a revolutionary mathematical insight that overturns old paradigms or an innovative design like the plasma beat-wave technique or maybe even signals from the deep reaches of the universe that will provide further impetus to our understanding of nature. After all, this is not the first time that prophets of doom have pronounced the end of science.